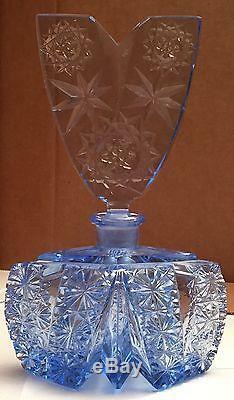 Vintage Blue Cut Crystal Czechoslovakian Perfume Bottle w/ V-Shaped Stopper. 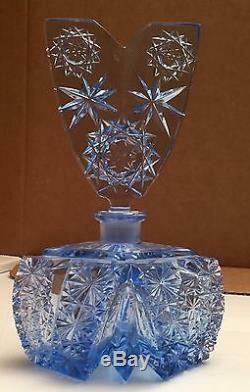 Beautiful diamond-shaped blue cut crystal Czechoslovakian perfume bottle. 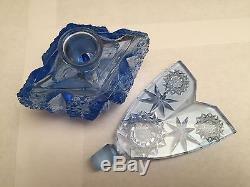 Matching V-Shaped stopper (no dauber) with same deep cut designs as bottle. 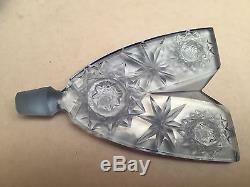 Bottle has deeply cut star shaped designs on front and back. Bottle stands at 6.25 tall. Acid etched stamped oval with Made in Czechoslovakia. Small chip on one inner corner of stopper. There are a few very tiny fleabites in stopper, barely noticeable. Normal wear and tear on base. A few nicks in neck of bottle where the stopper rests. _gsrx_vers_783 GS 7.0.5 (783). The item "Vintage Blue Cut Crystal Czechoslovakian Perfume Bottle with V-Shaped Stopper" is in sale since Monday, December 26, 2016. This item is in the category "Antiques\Decorative Arts\Glass\Perfume Bottles". 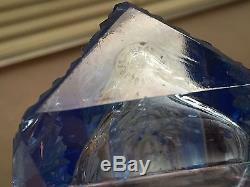 The seller is "sci_bay" and is located in San Francisco Bay Area. This item can be shipped to United States.